In late May/early June Twitter finally took some long standing API components out of service as they switched to Version 1.1. This shift had been advertised for some time – and most developers should have already have made the appropriate changes – but the new API represents a couple of important changes so I thought it might be useful to review these. The most significant change for many will be the final withdrawal of the last Twitter RSS feeds. The visibility of RSS was scaled back several API releases back (there used to be a link on each user’s page) but they remained available – and actually easier to call on – for those looking for them. They have now been entirely switched off with Twitter redirecting interest directly to the (less easy to use/play with) API or the (much more tightly controlled) Twitter widgets and tools. The withdrawal of all RSS feeds is understandable in business terms – Twitter will now be able to monitor activity around a tweet much more easily and to, perhaps, push promoted tweets more directly, but it is a frustrating move in terms of the openness and re-usability of Twitter data. The recent introduction of a much expanded suite of Twitter widgets plugs many of the gaps left by the RSS withdrawal however the switch off proper will be surfacing other custom scripts, embeds, etc. that still need updating or replacement. Here at EDINA we needed to make some updates for the RSS switch-off. We display the most recent blog post (still brought in via RSS from our aggregated blogs) and tweet on the EDINA homepage as this gives visitors a sense of the most recent news and updates. For the Twitter update we have switched from a custom RSS feed from Yahoo! Pipes which aggregated and filtered content from the feeds for each of our 18 organisational accounts, to a widget highlighting the latest tweet from a Twitter List of our accounts. This new solution works reasonably well after some quick but crucial customisations to ensure a good fit with out homepage (whilst still obeying the Twitter display guidance), but the new widget, whilst convenient and Twitter-approved, does restrict our ability to filter out specific noise (retweets from other accounts, which may look more out of place on our homepage, in particular). The other change to accessibility and flexibility of data is less obvious but also frustrating for those who like to do a quick and low tech mash up or prototype. Whilst Twitter have been using OAuth for some time this update ensures that effectively no Twitter tool, app or widget can use anything other than OAuth – rendering the RESTful API a rather different beast to use. With that last change in mind users of Martin Hawksey’s excellent Twitter Archiving Google Spreadsheet may want to make sure they have upgraded to Version 5. 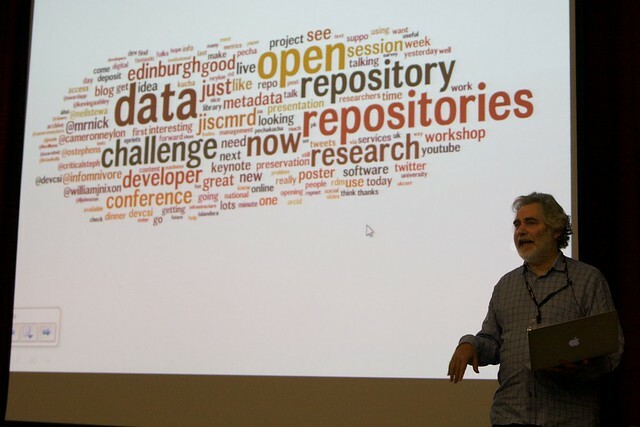 Following the closure of TwapperKeeper and the discussion of how to save tweets at the IT Futures Conference I thought it might be useful to include the Storify archive of Tweets from the day here. It also happens to be a very good excuse to try the newest plugin on the EDINA Blogs platform! We are using the Storify Plugin for WordPress which seems to work pretty well but I would love to know what you are using for your own Tweet storing/publishing purposes now that TwapperKeeper has gone, replaced with premium HootsuiteArchives. If you’ve not used Storify before it’s essentially a tool for gathering and presenting Tweets but also mentions on blogs, Facebook, search results etc. The Storify plugin works pretty simply – once installed you can create new archives from within WordPress or you can click on the Storify button on the Post editing window to access stories already created. As with the website the embedded Storify loads the first chunk of updates then as you scroll down it loads the next batch – so scroll through to see the full set!